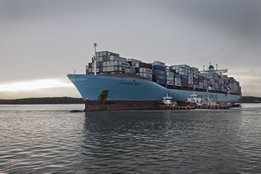 Maersk May Invest "in a Few Scrubbers"
Despite being a long time sceptic of the technology, A.P. Moller – Maersk says it may invest "in a few scrubbers." But there is no major u-turn on the technology, with Group CEO Søren Skou saying Friday during its latest earnings call that any such move would be "simply to understand the technology." Maersk was one of the first companies to take a firm stance on scrubbers, telling Ship & Bunker in May last year that "scrubbers will not be the way forward for our fleet" - a position reiterated many time since and again on Friday. "We don't like the solution. I've spoken to that many, many times," said Skou. "We think that the sulfur should be taken out of the fuel at the refinery where you have the big process plants to do so. And for us to build washing plants on 700 ships simply does not make any sense to me." And while Skou said he does not think it is feasible to retrofit ships with liquefied natural gas (LNG) propulsion, said his company "are experimenting with various things." "While we prefer a land based solution, Maersk is looking into all possible compliance opportunities for the 2020 sulphur cap," a spokesperson for the company told Ship & Bunker. Space in landed tanks tight, ship waiting to discharge.